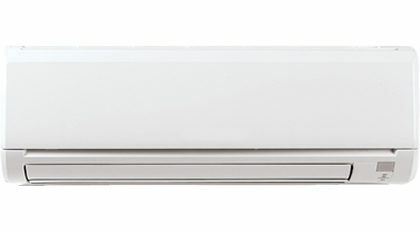 Installing an efficient ductless heat pump (DHP) allows you to heat and cool your home while using less energy and lowering your utility bill. Compared with traditional electric baseboard or electric forced air furnaces, DHPs use 25-50% less energy, which means significant annual savings for you. DHPs are also reliable, easy to operate using a remote control and provide consistent heat. DHPs have built-in air filters to keep equipment clean and improve indoor air quality. and They use ultra-quiet fans to reduce noise common to other heating and cooling systems. A DHP includes two main parts: an indoor unit and an outdoor unit. The indoor unit is mounted on the wall in your main living area. It is connected to the outdoor unit, which is placed on ground level, with copper pipes and electrical wiring. Connecting the units only requires making a three-inch hole in your exterior wall, so installation is relatively easy. In contrast to central heat pumps, DHPs do not require you to install a duct system throughout your house. We offer eligible property owners a $500 rebate towards the purchase and installation of a qualifying DHP for homes with a forced air electric furnace or electric baseboard or wall heaters. The rebate is limited to one per home or living unit. Additional rebates may be available from product manufacturers, so ask your contractor about your options. To help you purchase a DHP, we offer a seven-year, zero-interest loan. The maximum loan amount is $4,000 and the monthly loan payment is about $48. You must own the home and land. Eligible properties include owner-occupied homes and rental properties up to four units. Eligible customers must have a good TPU payment and credit history. The contractor doing the work must have an active Trade Ally Agreement with us. If the total cost exceeds the loan amount, you are responsible for the remaining balance. Additional documentation is required for loan applications. DHP systems installed by the homeowner or any other or any other contractor not listed at http://www.goingductless.com.